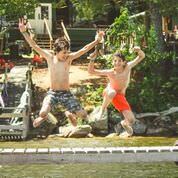 We are one of the only camps that does not have mandatory swim classes for all campers. Instead, we have a very vibrant waterfront for which a two-part swim test is a requirement for participation. Waterskiing: [View Video] Ski behind six championship ski and wakeboard boats running almost non-stop from 9 am-6 pm seven days a week. We are able to ski 100 skiers each day. Wakeboarding: [View Video] We offer three dedicated competition wakeboard boats with wakeboard towers and adjustable weight ballast. Equine Wakeboarding: The most advanced wakeboarders earn the right to wakeboard being pulled by a horse running along a beach, our most unique and coolest activity opportunity. Wakeskating: Advanced wake-boarders and advanced water skiers earn the right to try our wakeskate. Tubing: Tubing is run several afternoons a week as a separate activity from waterskiing. Lake Sailing and Racing: [View Video] With six different fleets of sailboats and expert sailing instruction we have long been considered to have perhaps the best sailing program in camping. Learn to sail for the first time or progress to more advanced and challenging boats. We have fleets of Optis, Lasers, Sunfish, 420s, Hobie Cats, and perhaps our most technically advanced and fun fleet of British Topper 15s rigged with spinnakers and jobs. Ocean Day Sailing: Day trips aboard our 24’ Pearson Ensign day sailor are available four days a week to sailors who have passed at least two sailing award level stripes. Our ocean day sailing program is available as part of our regular program at no additional cost. Ocean Yacht Cruising: We offer an optional three-day, two-night cruise aboard 38’-40’ yacht. Campers sail among the beautiful islands of Penobscot Bay, visiting harbors along the coast. They also camp on an island and enjoy cookouts of steaks and lobsters. Many consider the cruise the highlight of the camp experience and about 75 percent of our campers participate each summer. Windsurfing: A US Olympic windsurf team member developed our windsurf program. 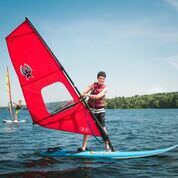 We have a fleet of windsurfers to fit campers of all sizes, all ability levels and for a variety of wind conditions. Tow Surfing: Being pulled behind our windsurf 17’ Boston Whaler powerboat on a windsurfer or surfboard has become a popular and fun activity. Kayaking: Campers learn to kayak on our calm, flat- water lake, but many paddlers progress to ocean and river kayaking. Canoeing: Campers learn basic canoeing skills on or lake and to build up stamina and proper technique. • More advanced paddlers have multiple white water river canoeing trip opportunities. 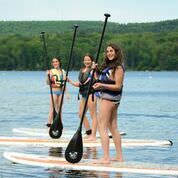 Stand-up Paddleboarding: Paddleboarding has become a popular activity to learn particularly on hot sunny days. We have a fleet of eight top-of-the-line paddleboards. Rowing/Crew: We teach an introduction to rowing in three single crew shells taught by experienced top competitive university rowers. Scuba Junior Open Water Diving PADI Certification Course: We offer a certification course for campers 12 and older. • Master divers lead classroom study and underwater classes on our property. • This is the only activity parents must sign up for in advance, due to the limited number of course spaces available. • PADI Course offered Week 3 and Week 5. Cost is $575 plus $169 for required PADI eLearning. Snorkeling: Learn to snorkel in our lake during afternoon activity periods. Water Toys: Every warm afternoon the inflatable 14’ climbing pyramid, giant waterslide, water trampoline, and log rolling toys are packed with happy campers playing and relaxing in often the most popular afternoon activity. Swimming: Earn Red Cross level awards, swim for fun or keep in shape for swim team with our lap swim training. Environmental Science and Marine Biology: Our lake and ocean side property is rich for environmental study. We explore the on-property ocean tide pools for crabs, mussels, Starfish, periwinkle, and spiny sea urchins.